Showing results for tags 'sprinjene'. I've often wondered who it was that decided that nearly all toothpastes need so much mint flavor that you can't taste anything else but mint for hours after brushing? This has always been a pet peeve of mine with toothpastes, and I often avoid brushing my teeth before I plan to eat or drink anything that I actually want to be able to taste. SprinJene toothpaste does not fall into this trap. In fact, I was blown away by the mildness of the mint flavor in this premium toothpaste, and the excellent and unusually clean feeling that it left in my mouth for hours after using it. After reading more about this gluten-free toothpaste, I believe that the pleasant mouth feel was likely due to the black seed oil that it contains. Apparently black seed oil has been used for millennia for its antioxidant, antibacterial and anti-inflammatory effects, and black seed oil was even found in King Tut's tomb. 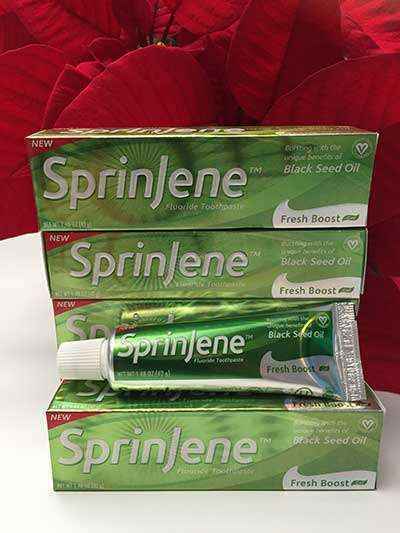 SprinJene was developed by a scientist whose goal was to create a toothpaste that doesn't contain harsh chemicals or abrasives, but still cleans and whitens teeth, and protects tooth enamel. Thankfully SprinJene also saw the need to dial down the mint flavor when they were formulating this excellent toothpaste, so that I can actually taste things after brushing...and to that I say: Bravo! For more info visit: www.SprinJene.com.